Cranfield University Blogs | What happens if you decide to change your course? I am studying Advanced Mechanical Engineering in the energy department of Cranfield University. I came here from Silesian University of Technology, from Poland. I was also studying Mechanical Engineering there. I am here on double diploma studies supported by the Erasmus exchange program. For my bachelor’s studies, I studied half a year in Spain, at Universitat de Jaume. I like studying abroad and getting to know new cultures, people and languages. I try to grasp every opportunity to do so. What may seem exceptional in my case is that my bachelor’s degree was in chemical engineering. After I finished my bachelor’s I decided to change my carrier path, as I realized I am much more interested in the design part of engineering. So, the ideal decision for me was to go for mechanical engineering. Fortunately for me, my home university allowed me to do so. I started my master’s in mechanical engineering, which, as you may imagine, was much different from what I had done for my bachelor’s. I had many fears, and doubts about whether I could manage it, but this decision was about the rest of my life, so I decided to focus and take upon this challenge. I did great in my home University at first semester, although with quite a big effort as you can imagine. Then I decided to go even further with it. My grades were sufficient to apply for double diploma in Cranfield University, as Silesian University of Technology has an agreement with it. I thought “You only live once”, and decided to go all out on it. It seemed a huge challenge, so I concluded to maybe start a course – Energy Systems and Thermal Processes – in Cranfield University, as it would combine my knowledge from chemical engineering and mechanical engineering within the energy department. So, I applied for Energy Systems and Thermal Processes at Cranfield University, and was accepted to be sent out to Cranfield by my home uni. I bid goodbyes to my family and girlfriend, and set off on my flight from Poland. I arrived in Luton Airport and went to Cranfield University by taxi. I arranged to share a taxi with another student coming to Cranfield. We hooked up on Facebook. I must say at the beginning I was feeling strange, joining an all new environment, with new people and places, but the university did well. There was a lot of information which helped me to register and organise myself at the beginning. So, I was signed in at the university and waiting for the lectures to start. Unfortunately, I still had this thought that the course I had chosen to study was not exactly what I wanted to do. One day I decided to stop it, and try to ask about the possibility to change my course from Energy Systems and Thermal Processes to Advanced Mechanical Engineering. Although I was full of doubts about whether it would be possible to swap in such a high-level university, I decided to follow my dream to become fully qualified mechanical engineer. Cranfield University was very helpful in this matter. I had a meeting with the course director. He helped me to understand the challenges I would have, but told me that the university was OK with me changing the course, that I would be supported and that the decision was now up to me. After some struggles, I finally decided to go for it, and I did. I officially signed up for the Advanced Mechanical Engineering course. I am describing it all in such a detail, because maybe some of you will have a similar problem, and you’re thinking “Will I manage?”, so I will try to answer this question in next paragraph. When courses started, I was quite worried. I was observing others (with a mechanical engineering background) and how well they understood all the concepts presented. I must admit in Cranfield University you will have contact with quite sophisticated science, but what else would you expect? It is challenging, but the lecturers have this unique approach, which helped me a lot. They always try to explain any particular matter right from the origin. They are aware that some people here have had a long break from studies, or maybe a slightly different background from what is needed. So, it made it much easier and manageable to go through all the modules. Although it was not easy, and sometimes I spent a lot of time studying either in library or in my room, now after all the modules are finished I feel fulfilled. The decision to change the course seems to have been a very good one. I feel really happy that I did it. To sum up, I must admit Cranfield University is a demanding one. You will have to learn here a lot. But the knowledge presented is in an understandable way, even with complicated problems. So, if you want to change your life, learn a lot, and get a respectable degree Cranfield is just for you! Try it! It is not easy but with motivation, ambition and a hard-working attitude you are destined for success. 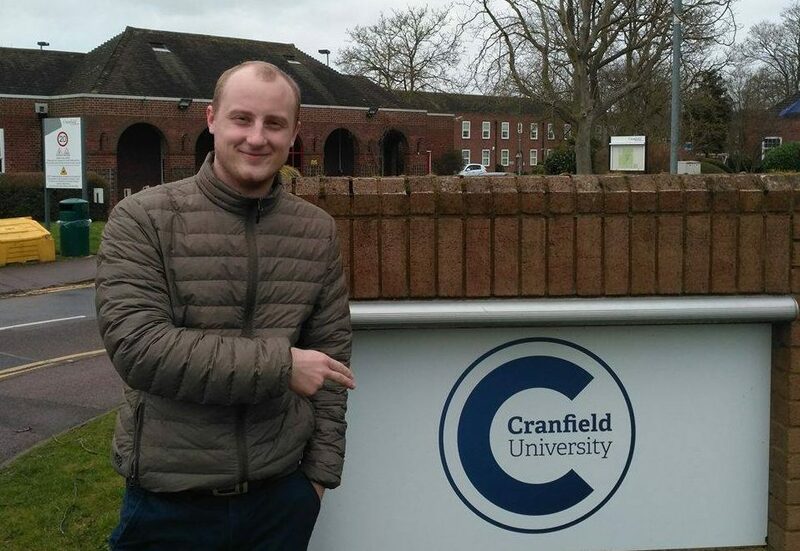 Bart is studying Advanced Mechanical Engineering MSc at Cranfield University, as part of the Erasmus double degree programme with Silesian University of Technology in Poland. He really likes studying abroad and getting to know new cultures, people and languages. Great article, I have been looking for this type of content for a few weeks now. articles seem to very important. I love the real world example you did.